According to the Movement Advancement Project (MAP), 4.3% of adults in Colorado identify as LGBT, yet the same demographic represents 8% of the state’s past-month cannabis users. That rate of engagement suggests the LGBT community as a significant if largely untapped business opportunity to develop products and brands catering specifically to the demographic. The LGBT community at large both supports cannabis legalization and consumes cannabis at significantly higher rates than heterosexuals. 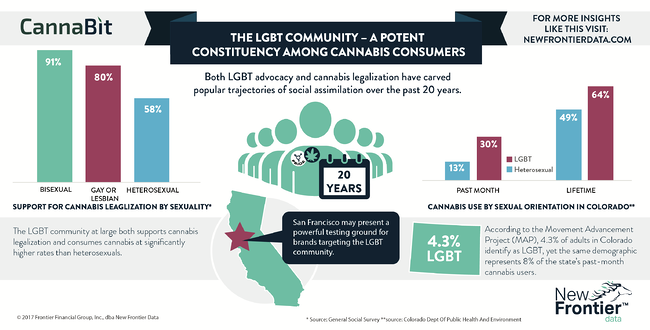 Both LGBT advocacy and cannabis legalization have carved popular trajectories of social assimilation over the past 20 years. LGBT advocacy and cannabis legalization represent two of the fastest evolving public opinion issues in contemporary American society. As a traditional hotbed for the American LGBT movement, activation of the adult use market in San Francisco may present a powerful testing ground for brands targeting the LGBT community. Continued exposure of LGBT advocacy may strengthen the economic impact of the community, increasing its influence among trendsetters in the fast-evolving cannabis industry.